Panormo lies 20km east of Rethymno. Unlike its western neighbour Platanias, Panormo has a tranquil, Cretan atmosphere, making this an excellent destination for those seeking a quiet, relaxing and cheap place to stay. Panormo also has good beaches and is well-serviced by buses. After midnight there’s not much going on here. 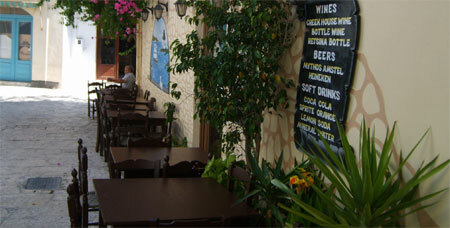 In the centre, there are small, car-free streets, where you’ll find the traditional Kafenion and shops. Beaches Panormo: There are two good beaches here. One is in the town centre, next to the port, and the other, bigger beach is 200m to the west of the town. The bigger beach is protected by big rocks, and both beaches have crystal clear water and are good choices. Buses to Panormo: In summer a bus to and from Rethymno leaves every thirty minutes (ninety in winter). Parnormo is also serviced by the Rethymno – Iraklio service, though they only stop at the motorway, 300m south of Panormo. Don’t forget to wave, otherwise they won’t stop! Calypso Cruises offers daytrips from Panormo in their boat. They sail five times a week to Rethymno, and twice to Bali (with stops at a secluded beach and some limestone caves). Prices are pretty high – it was about €25 per head in 2018. The Melidoni Cave, less than 20 km from Panormo, is an interessting place to visit. 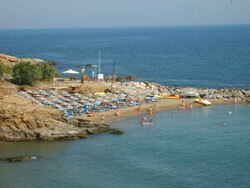 The next resort direction Iraklio is Bali, direction Rethymno Platanes.